Those are all great goals, and they definitely get the “fan” part right. The opening editorial adds to those goals, saying that they aim to celebrate comics with positive coverage and focus on books within the past five years. To kick off, the cover feature explores Nova’s history. There are light mentions of the circumstances surrounding various title runs, but it’s primarily an overview of the type “and then Nova appeared in that comic title, which ran for that many issues” along with comments from some of the creators known for working on the character. 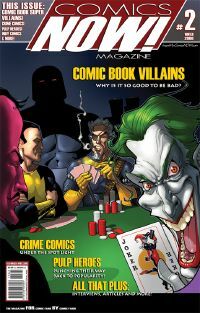 Other articles include a rundown of recommended podcasts, a lengthy piece about the need to hook readers from the first issue (good advice, but I’m not sure why it needed 12 pages to cover the topic; then again, if I’d been hooked enough to read the piece, I might know better), and a guide to Crises in the DC Universe. This is where I started thinking, yeah, it’s definitely by fans. This is what fanzines now look like, in a world where everyone has desktop publishing. While Nova has never been a major player in the comics industry, he certainly has a fan following. The only question that remains is will these fans, as well as new readers, help support the new series and bring the character up from his B-list status? Judging from the magazine size (like a comic), the glossy paper, and the full color, Comics Now! is interested in providing an alternative to Wizard, and they seem well on their way. I did find it difficult at times to tell the ads from the content. Speaking of which, I was glad to see the inclusion of actual comic strips. They’re only one-pagers, but they’re varied and entertaining. The first one, by Marty Devine, mashes up Exterminators and Mouse Guard (two books I can’t imagine have much other overlap). There are also two promotions for webcomics, Girls With Slingshots and In His Likeness. Some of the items I thought could be improved, like formatting and layout concerns, will be addressed in the second issue. There are multiple designers listed on the masthead, which may have contributed to the varying looks of the different articles and departments. More cohesion — especially in such simple things as font choice — will help. Also, some of the articles are quite lengthy. In-depth coverage is good, but not when page count is due to too much line spacing. I figure those involved just didn’t have much actual print experience, so they just didn’t realize (for example) that the margins were too close to the binding until they saw the first issue on paper. Oh, I haven’t yet mentioned the columns. There’s one about trade paperbacks (the first mention of graphic novels in the magazine) that looks at changing sizes for reprint material. There’s one on webcomics that starts by basically saying they exist and then including a page listing some. One on older comics about Superman’s origin. (No, really.) One on indy comics that says they exist and recommends seven. One on being a fangirl that will hopefully get past justifying its tokenism next issue. That’s a problem with most of these, really… they worked too hard at introducing the concept of their particular department instead of jumping in and talking about something significant in the area. The most forgettable part of the issue was the Meanwhile… section, which summarizes recent issues of Spider-Man, Superman, X-Men, and Batman. Unfortunately, by the time I read this, they were six issues out of date. There’s also a feature on how the cover was put together and a letter column. With the lack of information on graphic novels and the focus on DC, Marvel, and serialized genre indy comics, I’m not the target for this, but I still think it’s handsomely produced and shows potential. My overview may sound harsh, but I wouldn’t bother pointing out room for improvement if I didn’t think the publication had a chance for a promising future.